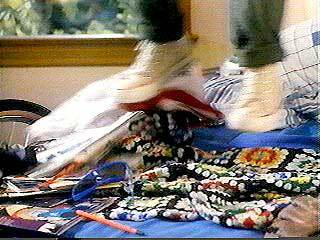 Austin O’Brien and Samantha Mills wear optical white and black high top Converse “Chuck Taylor” All Stars in the film. Jerry discovers that some miniature dinosaurs have hatched in his basement. Prehysteria! opens with a scene somewhat reminiscent of Raiders of the Lost Ark. Rico Sarno (Stephen Lee), an unscrupulous curator of a museum in America is on an expedition in a South American jungle. Disappointed with his meager finds, he badgers his native guide to show him the cave where the sacred artifacts of his tribal ancestors are located. Insulted, the natives run off, but Sarno manages to stumble on the cave entrance, and inside he finds what appears to be five frozen eggs. Meanwhile, back in California, we are introduced to the Taylor family. Frank (Brett Cullen) is an amateur archeologist and raisin farmer who collectes fossils and sells them to the museum where Sarno works. A single parent, Frank has two children, Jerry (Austin O’Brien), a young Elvis fan who fantasizes being a rock star, and Monica (Samantha Mills), a teenager who is bored with life on the farm and wants to hang out with an older, partying crowd that Frank disapproves of. Both Sarno and the Taylors have identical coolers, and in a mixup, the coolers are switched when they happen to meet at the museum. Frank was distracted by Vicki (Colleen Morris), Sarno’s lovely assistant who he has a crush on, and Sarno is dreaming of the fame and fortune that soon will be his due to his discovery. Sarno’s cooler contains the eggs, and when it is brought to the Taylor farm, Ruby, Jerry’s dog grabs it and takes it to the basement, thinking there are food scraps in there to eat. When Sarno discovers his loss, he quickly drives out to the Taylor farm demanding his cooler back in exchange for the Taylor’s, which he returns to them. But none of the Taylors know where Sarno’s cooler is, and when Sarno starts becoming rude, Frank throws him off the property. Monica is startled by a strange sound while doing the laundry. In the basement, the dog opens the cooler, takes out the eggs, and then sleeps with them, causing the eggs to hatch five miniature dinosaurs. Jerry is the first to discover them, and awed by his find, he quickly names them after rock singers. One of the dinosaurs is a pteranodon, and when it flies out of the basement through the laundry chute, it scares Monica, who thinks it is a bat. Luckily, Jerry prevents her from smashing it with his guitar, and shows Monica the other dinosaurs. The dinosaurs have voracious appetites, and eventually escape out of the basement into the Taylor kitchen, where Frank discovers them gobbling up their food. Frank realizes that the dinosaurs were what Sarno was after, and tells Jerry that they should return them. But Jerry insists that since Ruby hatched them, they should be the ones to keep them. In town, a frantic and furious Rico is determined to find the missing eggs, accusing both Vicky and Whitey (Tom Williams) the maintenance man of stealing the cooler. When Rico begins harassing Vicki about the location of the cooler in an obnoxious way, she ends up decking him, and then drives out to the Taylor farm, not knowing what to do. Soon she finds out about the dinosaurs, and tells the Taylors not to give them back to Sarno, because he will exploit them. But Sarno is undeterred in his ambition and desire to reclaim the dinosaurs which he discovers on a return visit. When the Taylors refuse to turn them over to him, he hires some thugs to help him recover the dinosaurs. The remainder of the film deals the struggle between Sarno and the Taylors over possession of the dinosaurs. Monica is delighted when Jerry shows her the mini-dinos in their basement. Prehysteria! is the first of a series of family-oriented films produced by Moonbeam Entertainment made in the Disney tradition. They don’t have the budget of a Disney film however, and that is seen in the low budget special effects of the dinosaurs, the casting of mostly unknown actors (this was Austin O’Brien’s first film), and simple, fantasy-based stories. Nevertheless, if you want a pleasant diversion suitable for the whole family, then you will enjoy Prehysteria! 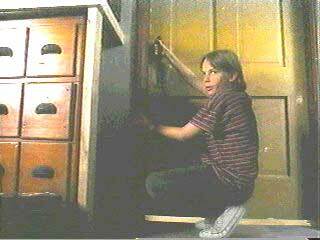 Jerry tries to prevent Frank from going down into the basement hideout. Jerry tries to prevent Jafe from taking away the dinosaurs. Austin O’Brien in his role as Jerry is seen wearing natural white high top chucks throughout Preshysteria! 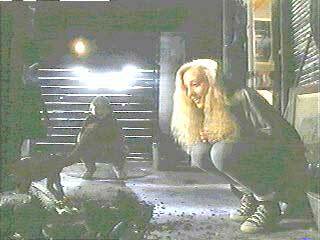 Samantha Mills playing his older sister Monica wears black high top chucks in many of her scenes. There are a few shots of them together wearing their chucks and some good individual shots like you see in the above pictures. The best action scene is when Rico and his henchmen come to take away the little dinosaurs from Frank, and Jerry struggles fiercely to try and stop them. The cinemaphotography shows some closeups of Jerry’s natural white chucks during his Elvis impression at the beginning of the film. Prehysteria! (1993) Brett Cullen, Austin O’Brien, Samantha Mills, Colleen Morris, Stephen Lee. Directed by Albert Band. Categories: Comedy, Science Fiction, Family.